What’s your vision for the future of your homecare agency? How do you plan to move your business down the field and score in the next three, four or five years? Who will be on your all-star team to make it happen? 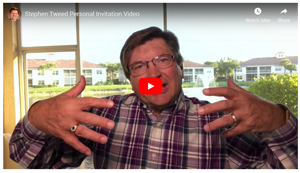 Get in the game with PHA’s interactive, one-day workshop with national sales and marketing expert Stephen Tweed, CEO of Leading Home Care…a Tweed Jeffries company. Tweed will lead an innovative discussion about the major trends shaping the future of home-based care, help attendees define a clear vision for the future, and develop a strategic scorecard to measure the performance of their agencies. Topics, including recruitment of the right team, critical metrics, and unique processes that work. Hear from Tweed directly on what to expect for the day by clicking below. Cancellation Policy: If you must cancel your reservation for any reason, please notify PHA in writing via email to [email protected]. If the notice of cancellation is received PRIOR to the day of the event/workshop, PHA will provide a credit, minus a 30% administrative fee. This credit must be used within one year of the date of issue on educational programming. Credit will not be accepted for membership dues or PHA’s Annual Conference. No credit will be given for no-shows or cancellations on the DAY OF or following the event/workshop. Substitutions are permitted up to the day of the event.